Uncommon resources are built to provide youth leaders with age-appropriate teachings and tools to get through to teens in a way that makes a lasting difference. From games and icebreakers to sermon object talks and worship experiences, these resources will help support and build your ministry. 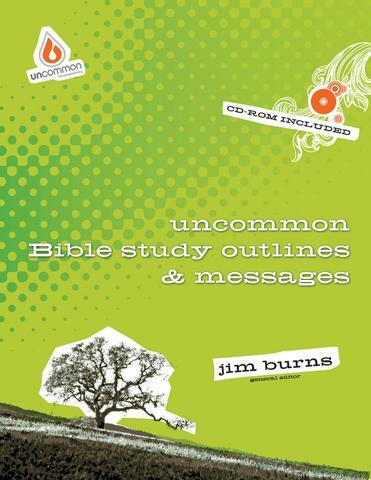 Uncommon Bible Study, Outlines & Messages is well of inspired and stimulating ideas, Jim Burns offers more than 20 ready-to-proclaim messages and 14 complete Bible studies that will have your imagination overflowing in no time. Your youth grow when you instill the Word of God within them. Now it’s simple to enrich their lives, because each message and study outline is packed with biblical truth and though-provoking application. Topics include faith, anger, loneliness, forgiveness, self-image, God’s calling, servanthood, temptation, suffering, and developing Christian character. Uncommon Camps & Retreats is the comprehensive resource that guides leaders through all the stages of planning camps and retreats – theme development, scheduling, gathering materials, setup and so on – and even offers sample lessons and activities. Twelve complete outlines are included (plus a bonus staff retreat outline and all student handouts are included in digital form). Everything youth leaders need to invite their group to meet with God… all in one book! Channel all that crazy drama into creative, engaging and memorable presentations that will open the hearts and minds of your students. Invite the teens in your group to participate as you explore together biblical concepts about life and faith. Over 70 dramatic presentations that can help you show and tell the message you’re called to deliver. Each drama includes key verses and additional Scripture references to help you tie-in the presentation with your talk, sermon or theme, and the handy subject index makes it easy to pick just the right script for your overall message. Feel like a stage pro with costume recommendations, prop lists and helpful tips for making preparation as no-drama as possible. Whether you flip the script for youth meetings, Sunday School classes, retreats, camps, parent nights, lock-ins or special events, Uncommon Dramas, Skits and Sketches gives you everything you need in an all-in-one, easy-to-use handbook. 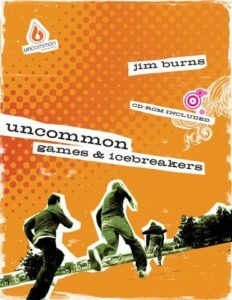 Youth workers can turn their youth groups into dynamic, exciting events that kids will actually look forward to with the great ideas found in Uncommon Games and Icebreakers. In this practical resource, leaders will find over one hundred innovative, group-tested ideas for fun games and original icebreakers. To make prep time easier, along with full instructions, each activity has margin icons that give vital information, such as number of people needed, in/outdoor activity, time required etc. These fun activities can be used in any high school and junior high setting, including church groups, retreats, special events – and they complement other Uncommon high school and junior high school group study resources. Teens love to reach out and help others in need. Some just do not know it yet! 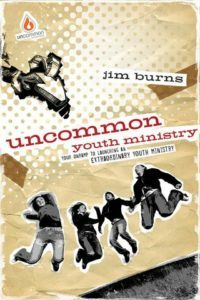 Uncommon Missions & Service Projects, part of a series of resources and group studies developed by youth ministry veteran Jim Burns, will help youth leaders prepare their group to discover the joy of serving God while serving others. This comprehensive resource has everything leaders need to prepare, organize and execute successful service projects and mission trips, giving teens life changing opportunities to put their faith into action. Included are more than 25 practical projects for groups of any size; Bible study suggestions on the topics of mission and service; sample letters, forms, checklists, itineraries and job descriptions; a short-term missions handbook with step-by-step directions for planning trips and much more. Now leaders can inspire in their teens a hunger for God and an appetite for loving their neighbors, at home and around the world! You already know that teens learn best when they talk with each other.. not when you talk at them. But how can you guide the conversation in the right direction so that the youth in your group discover the truth for themselves? 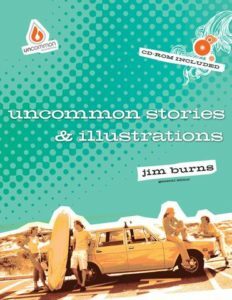 Uncommon Object Lessons & Discussion Starters, created by veteran youth minister Jim Burns, brings together 90 field-tested tools for sparking dialog that will fire your students’ passion for God and His Word. Those conversations will help them actively live out their faith – and turn every group meeting into a dynamic, relevant confab they can’t wait to attend. Each object lesson and discussion starter includes key verses and additional Scripture references to help you tie it in with your session or theme, and the handy topical index makes it easy to pick a suitable object lesson or discussion starter for your focus. Whether you’re aiming for silly, thought-provoking or moving, you can hit just the right note in your next youth meeting, Sunday School class, retreat, staff meeting, parent night, camp, lock-in or outreach program. Give your students something to talk about and see what happens. When you’re talking to teens, few things leave an impression like an unforgettable story. Whether it’s a humorous page from the history books, a mind-bending whodunit or a fairy tale with a twist, stories cut right to the heart of the matter – and the hearts of your youth group. Now you can grab your group’s attention with memorable stories that bring biblical concepts to life with Uncommon Stories and Illustrations. 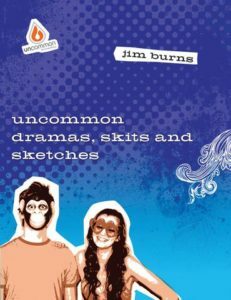 In this must-have resource, veteran youth ministry Jim Burns brings together more than 130 engaging tales to illustrate your message and impact the hearts of teens. Each story is arranged by subject and includes key verses and additional Scripture references as starting points for talks and sermons. Whether you spin a yarn for youth meetings, Sunday School classes, retreats, staff meetings, parent nights, camps, lock-ins or outreach programs, you’ll tickle funny bones, provoke thoughtful conversations and open hearts to receive the ultimate Storyteller: Jesus Christ. 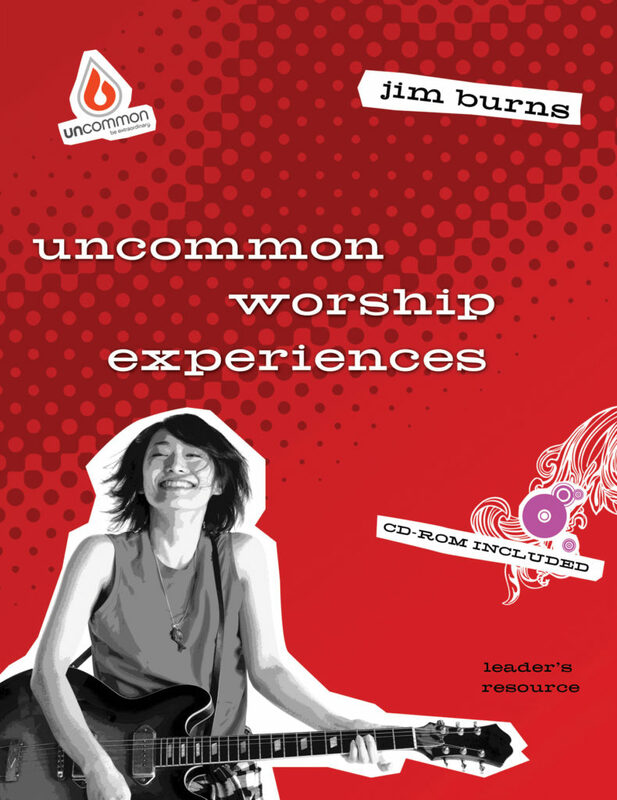 Uncommon Youth Parties, part of a series of resources and group studies developed by youth ministry veteran Jim Burns, will help youth leaders find a number of time-saving ideas for planning outreach, fundraising, fellowship, birthday events and holiday celebrations all year round. This easy-to-use resource, developed and field-tested by veteran youth workers, includes message and activity ideas, promotional tips and comprehensive outlines to not only build fellowship within the group but also serve as an outreach tool to bring others into it. All the tools leaders need to celebrate any occasion are right at their fingertips! When worship is done right, it connects teens with God and each other like nothing else. But it can be difficult for teens to overcome their insecurities and inhibitions to enter God’s presence. Now, with Uncommon Worship Experiences, you can invite students to trade their self-doubt for confidence in God’s love and acceptance! This comprehensive resource will help you create a culture of worship in your group by fostering an atmosphere of freedom and leading by example. Inside you will find articles and Bible studies that explore every facet of worship—what it is, what it is not, why we do it, how to do it right, and much more. Also included are reproducible planning and evaluation sheets, creative group prayers, biblical meditations and activities, sample worship service plans, a sample camp worship booklet and tons of helpful suggestions for creating a worshipful environment at your next group meeting, Sunday School class, retreat, camp, lock-in or outreach program. With Uncommon Worship Experiences, you will have all the tools you need to enter God’s presence and bring your group along! Your On Ramp to Launching an Extraordinary Youth Ministry! This comprehensive and practical resource about relational youth ministry is designed to help youth leaders build active, healthy youth groups that lead students to commitment to Christ through genuine relationships with their peers and youth workers. Theoretical enough to be used as a youth ministry text, yet practical enough for lay leaders to use effectively. Includes information on relational ministry, understanding youth culture, developing student leadership, building youth staff, discipling for lasting commitment, stimulating individual faith, effective counseling, promoting a sense of mission and evangelism, creative teaching of God’s Word, interrelating with parents and the whole church, fundraising, emphasizing authentic worship and so much more! Jesus Provides What We Truly Need in Every Life Challenge. Every day youth are bombarded with the world’s definition of power, riches, peace, hope and love. 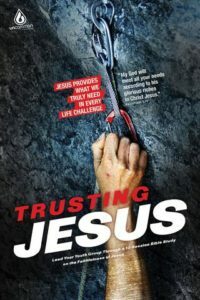 Trusting Jesus, an Uncommon elective, will help youth discover true power, true riches, true peace, true hope and true love. With this twelve week study, youth will dig into the Bible’s promises that Jesus provides what we truly need for every challenge in life. Based on Philippians 4:19, “my God will meet all your needs according to his glorious riches in Christ Jesus” this study guide is not just about biblical facts and figures: it is about knowing, loving, and serving a great God. It is about God’s plan to bring people out of darkness and sin back into relationship with Him through Jesus Christ. I heartily recommend these studies.